Aristotle is one of the very greatest thinkers in the Western tradition, but also one of the most difficult. The contributors to this volume do not attempt to disguise the nature of that difficulty, but at the same time they offer a clear exposition of the central philosophical concerns in his work. Approaches and methods vary and the volume editor has not imposed any single interpretation, but has rather allowed legitimate differences of interpretation to stand. 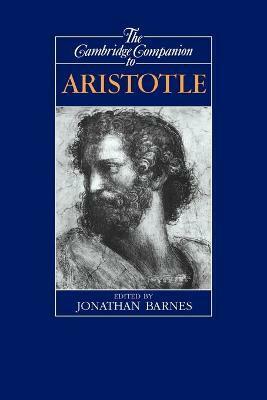 An introductory chapter provides an account of Aristotle's life, and then guides the reader through the complex subject of what Aristotle actually wrote as a basis for characterising his philosophical development. Subsequent chapters cover Aristotle's writings on logic, metaphysics, science, psychology, ethics, politics, rhetoric, and poetics. It is a basic assumption of the Companion that its readers will not know Greek. Introduction: Aristotle's writings; 1. Life and work Jonathan Barnes; 2. Logic Robin Smith; 3. Metaphysics Jonathan Barnes; 4. Philosophy of science R. J. Hankinson; 5. Science R. J. Hankinson; 6. Psychology Stephen Everson; 7. Ethics D. S. Hutchinson; 8. Politics C. C. W. Taylor; 9. Rhetoric and poetics Jonathan Barnes. Jonathan Barnes lehrte Philosophie an den Universitäten von Oxford, Genf und Paris. Er ist Mitglied der Britischen Akademie der Wissenschaften, Autor zahlreicher Werke zur griechischen Philosophie, insbesondere über Aristoteles, und Herausgeber von dessen gesammelten Schriften. An introductory chapter provides an account of Aristotle's life and then guides the reader through the complex subject of what Aristotle actually wrote as a basis for characterizing his philosophical development. Subsequent chapters cover Aristotle's writings on logic, metaphysics, science, psychology, ethics, politics, rhetoric, and poetics.